Alliance Jumbo High Speed Laser Rolls go through a rigorous inspection, manufacturing and quality assurance process which meet or exceed OEM specifications for optimum moisture content, cleanliness and finish. 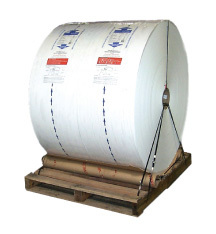 Rolls are placed and packaged on a specially designed pallet of heavy-duty construction to handle load weights at different points, fiber checks, double strapped banding, and custom labeling. Each individual roll is shrink wrapped and placed on a moisture barrier for protection. Alliance Jumbo Laser Rolls are designed to maximize the efficiency and productivity of high speed continuous laser printers. Laser Rolls eliminate the downtime required to change cartons of form products. Laser Rolls are available for both data processing and direct mail applications. Quality and performance are 100% guaranteed.